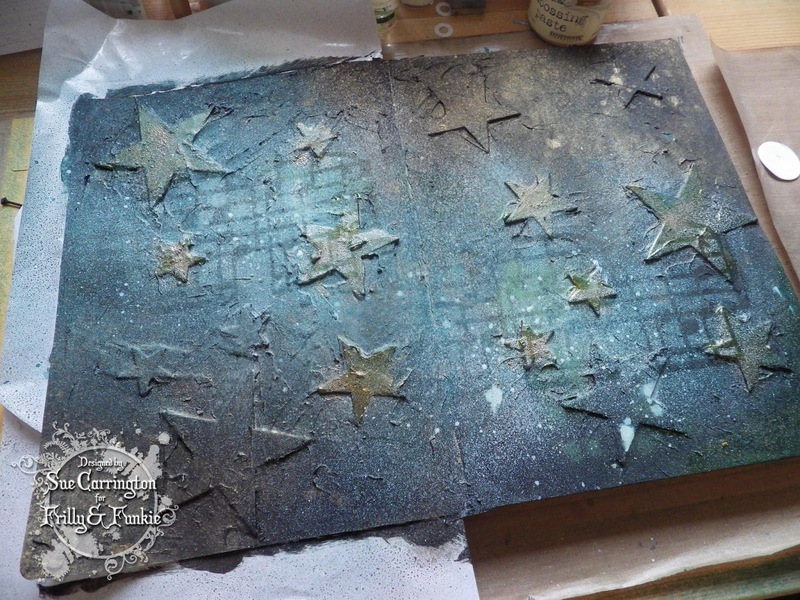 Make a shabby chic or vintage project with music as the central theme. You can add musical instruments, music paper, sentiments about music or even vintage images with a music theme. Thinking about musical lyrics and also about the recent sad news about David Bowie I settled on one of his fabulous songs to use for inspiration. I die cut lots of stars from cardboard and glued them to my journa l page. I then used Ranger texture paste and spread it over the page and left it to dry overnight. 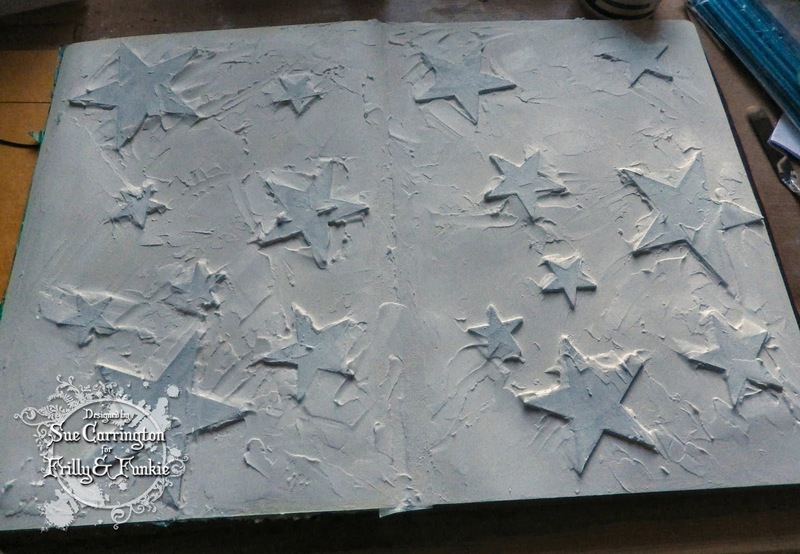 The page was then painted with black Gesso and spritzed with Lindys Stamp Gang sprays. The colours don't show up too well in the above photo but they look beautiful in real life. 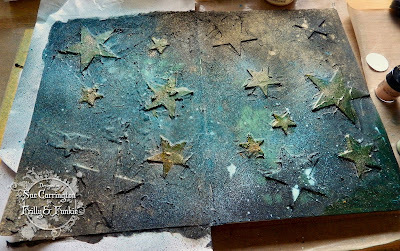 The stars that run diagonally across the page were rubbed with Wendy Vecchi gold embossing paste then sprinkled with Lindy's embossing powder. I then rummaged through my stash looking for a white spray and found a bottle with no label on it but it worked any way ! 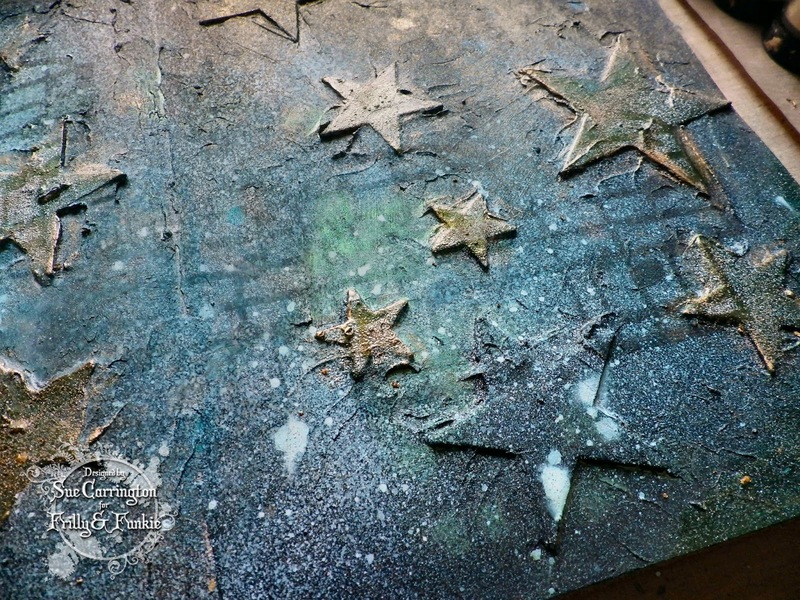 I'd got a Tim Holtz mask from years ago which I spritzed the white spray over. 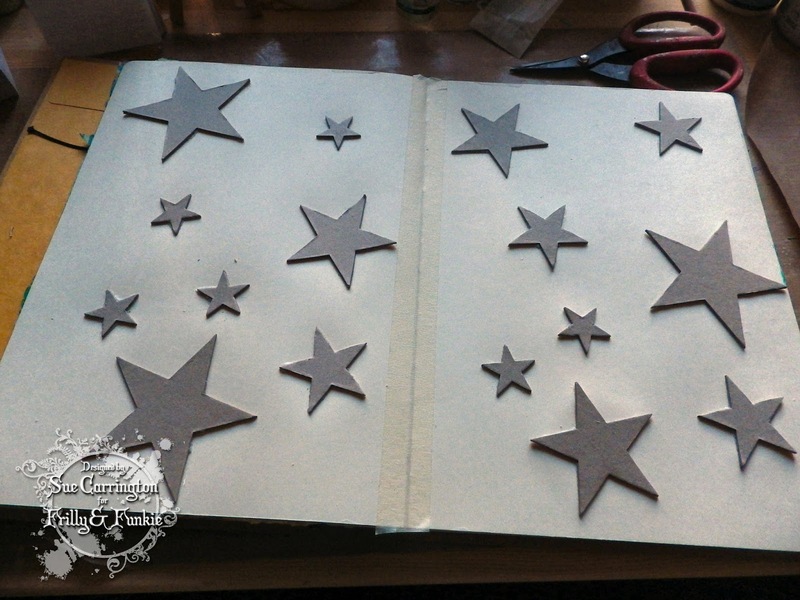 To make the stars shine a little more I rubbed some Classic Treasure Gold around the shiny stars. This turned out to be quite a dark piece in the end but I love it ! 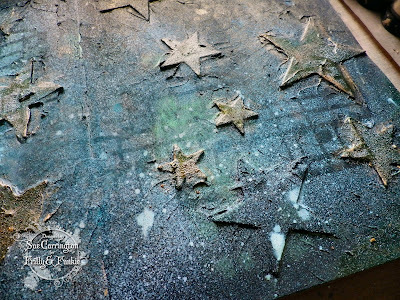 I hope you get chance to join us for this challenge and do make sure you check out the rest of the DT's fabulous projects on the Frilly and Funkie blog. 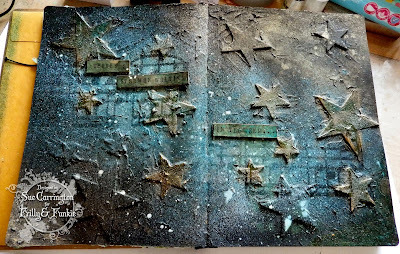 Love this journal page. 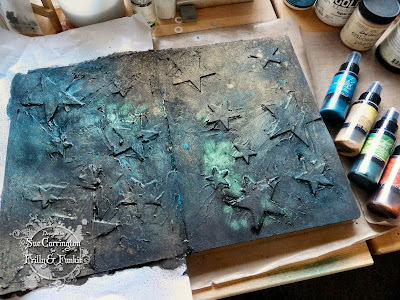 The texture is fantastic and I love all the shimmer on the black gesso. David Bowie's music wasn't my favourite so I don't really know any of his songs but I have seen so many crafters doing pages and layouts to honour him and yours has to be the best by far. Such a fun tribute Sue and it turned out lovely. j. This is fantastic, Sue. I love the your take on this challenge theme. Very clever and touching and the artwork...sensational! You totally nailed this challenge. Great work! This is gorgeous! I love the rich colors and effect in the background of your beautiful night. Superb Sue! 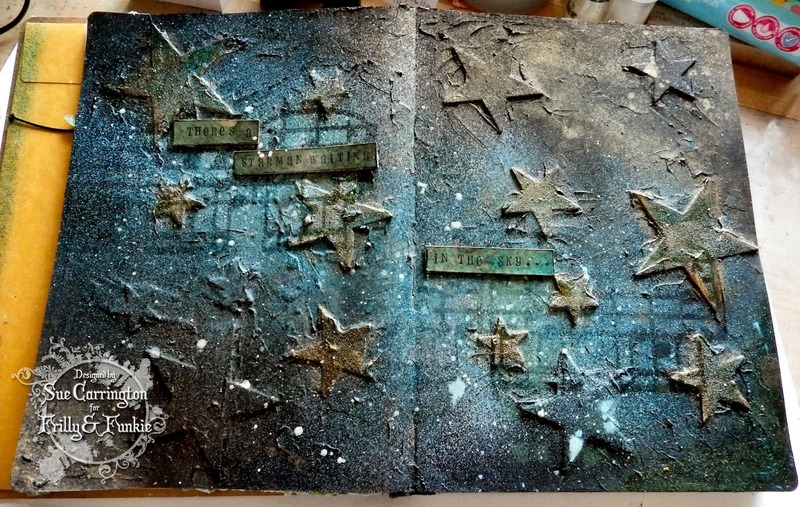 I absolutely love the dimension and texture to our page and the way you added the music notes. Fantastic tribute to the late great David Bowie. Hi Sue...........although dark I absolutely love this make. 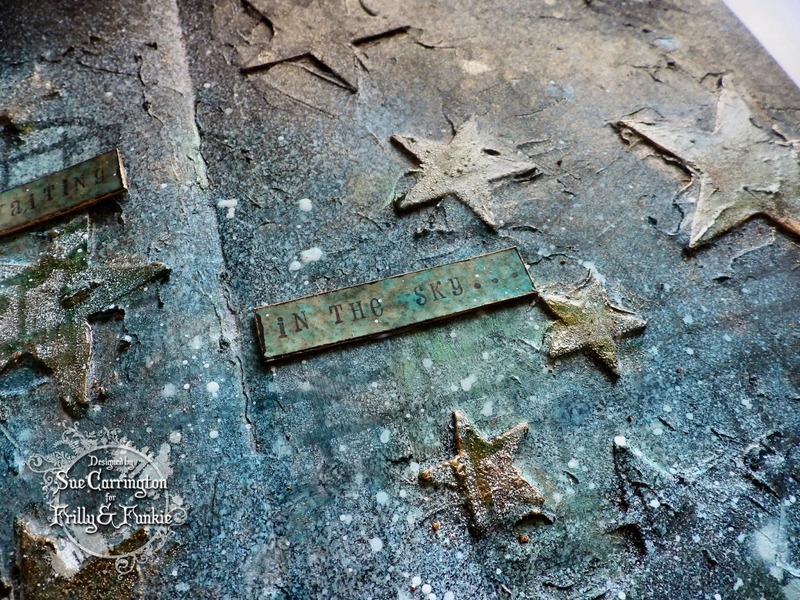 The textures and background lok fantastic and the stamping really add to the depth.